We will help you preserve your teeth so you can avoid dental problems down the road. Our hygiene department has been designed to provide you with thorough dental cleanings and gum care. We have trained our hygienists in the latest procedures and technology. You’ll find our office and staff friendly, comfortable and efficient. We have flexible scheduling and it’s easy to make an appointment. Our central location in Midtown Atlanta, along with easy parking, make this the perfect dental office to take care of your oral health. Our staff has had advanced training in gum care and use the latest procedures in modern dental technology in order to effectively treat gum disease. We combine gentle ultrasonic gum therapy, a thorough teeth cleaning and antibiotic therapy to fight gum disease. Over the decades, our advanced gum care has saved many patients from developing more advanced stages of gum disease that could require advanced periodontal procedures, or that could lead to to tooth loss. Our hygienists are highly trained and very friendly. When you visit us you can depend on getting leading-edge hygiene care that is effective and customized to your dental needs. We have several excellent dental hygienists who are very experienced. In fact, our lead hygienist has been with us for over 15 years. 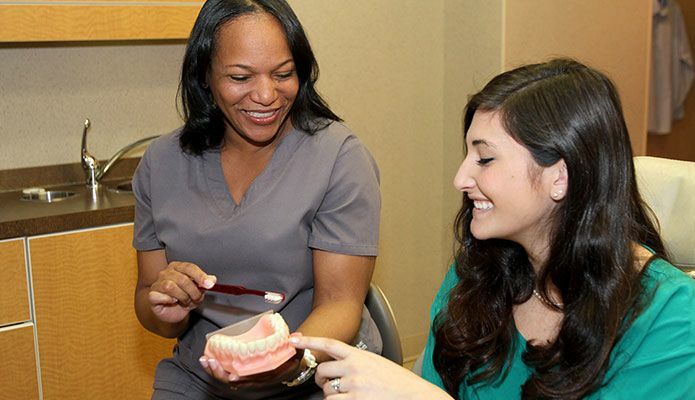 All of our hygienists are trained in a comprehensive university-level hygiene program. 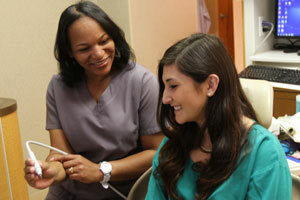 They have also taken continuing education courses and possess hands-on training in advanced nonsurgical gum care. Rest assured—your smile is in good hands. Here at the Atlanta Dental Center, we have created a comfortable environment, staffed with friendly professionals who will put you at ease. We listen to your concerns and answer all of your questions in plain English. Each patient has different needs, so our care is very personalized. During every visit, your mouth will be checked for new periodontal problems–which can otherwise go undetected–so we can nip them in the bud. Our goal is to keep each patient’s teeth and gums healthy and we always work toward their preservation. 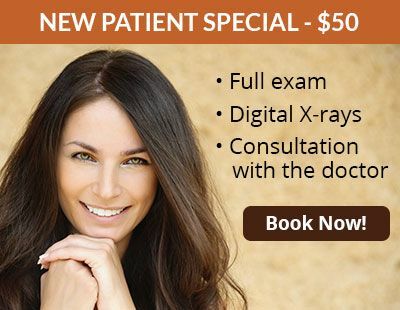 We offer new patients a comprehensive oral exam, which includes digital X-rays. And we will create a customized treatment plan. 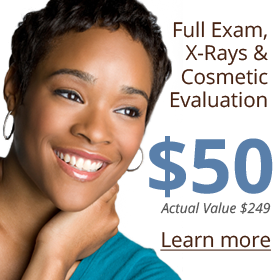 The usual cost for this comprehensive exam is $249. When you come in for our New Patient Special, we will take care of you right away. The ultrasonic scaler gently removes heavy stains and calcium deposits from your teeth. We recommend that you come in to see us for a checkup and dental cleaning every six months. You can count on our well-trained hygienists to be very gentle during your cleaning. Our hygienists use an ultrasonic EMS Piezo® scaler to clean your teeth. With this state-of-the-art technology, that uses sound waves, she can quickly and effectively clean your teeth with minimal discomfort and damage to the gums. She then uses a hand scaler for the fine removal of tartar. After your cleaning she will polish your teeth using a polishing paste and an air-flow device which removes additional particles, as well as heavy stains, so your teeth are bright and shiny! The air-flow device is particularly effective for patients with implants and orthodontics. After the cleaning, our hygienist will go over the areas that can be improved on with good oral care at home. With proper hygiene and regular cleanings, you will be able to keep your teeth and gums healthy for years to come. Losing teeth as a person ages is not written in stone. It doesn’t have to happen. You can protect your healthy teeth against gum disease – the #1 cause of adult tooth loss – with regular cleanings, as well as some simple instructions from our hygienists. In addition to providing thorough cleanings, our hygienists will show you how you can preserve your teeth for years to come. They’re here to help you learn more about dental health and good oral hygiene. 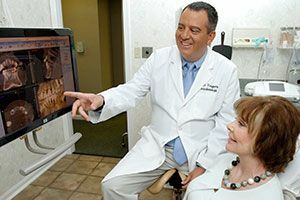 They take the time to explain the results of your digital X-rays, intraoral camera photos and gum evaluation chart in easy-to-understand terms. Our hygienists also take the time to explain how to effectively brush your teeth, the importance of flossing and how to floss, the purpose of using a mouthwash and how many times a day you should use it, along with when you should brush your teeth. Your oral hygiene at home is an important part of keeping your teeth and gums healthy. We can usually treat all levels of gum disease non-surgically. Gum disease is the leading cause of tooth loss and is associated with other chronic diseases, including diabetes and heart disease. That’s why good oral hygiene is of utmost importance. Our staff can help you eliminate gum disease with our state-of-the-art care, without surgery – in most cases. In treating gum disease our, hygienists use an ultrasonic scaler to gently scale each tooth. Scaling is the process of removing tartar from the tooth. Next, we fine scale using hand instruments to ensure all deposits are removed. This is followed by a rubber cup polish and air polisher, if necessary, for difficult stains. 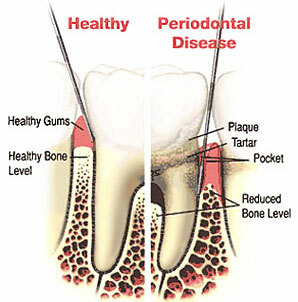 The more severe cases of gum disease are referred to our periodontist (gum disease specialist), Dr. Robert Vazquez. Gum disease is caused by bacteria. ARESTIN® is an antibiotic that helps kill the bacteria at the root of the problem. In treating gum disease, our hygienists place ARESTIN within infected gum pockets, right below your gum line. ARESTIN is very different from an antibiotic that’s taken in pill form, as it is placed exactly where it is needed on the infected gum. ARESTIN contains microspheres, which are tiny, bead-like particles that are not visible to the naked eye. These microspheres release the antibiotic over time, killing bacteria so that your gums can heal better. As a periodontist, Dr. Vazquez can treat all forms of gum disease. 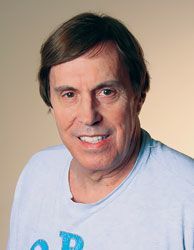 We are pleased to welcome Dr. Robert Vazquez to the Atlanta Dental Center. He was asked to join our team due to his high level of proficiency as a periodontist and as an implant dentist. A periodontist specializes in everything to do with the structures around the teeth, including the gums. If you have severe gum disease, you will be referred to Dr. Vazquez for a consultation and treatment plan. Dr. Vazquez has been practicing periodontics for 14 years and stays fully up-to-date on all the latest technologies and procedures in periodontics. Dr. Vazquez’ experience and training enable him to successfully treat even the most complicated cases. He uses a laser for gum re-shaping, as well as for removing diseased tissue, disinfection and for sealing the area in the “pocket”. This helps with faster healing and less post-operative pain. He uses minimally invasive methods where possible, including microsurgical periodontal surgery. He is also able to do surgical procedures when the severity of the gum disease warrants it. We are open as early as 7:30 a.m. and as late as 7 p.m. With these hours, you can get the dental care you need before or after work. And since we do not ‘double schedule’, like some dental offices do, we won’t keep you waiting long in our reception area. To request an appointment online, please fill out our online appointment form. One of our staff will contact you as soon as possible to confirm your appointment.